How do you entertain your Shiba? 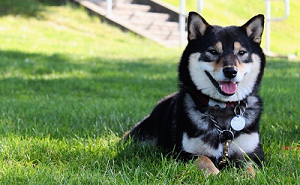 How do you guys keeps your shiba's active during the day? All day today Tsuki just wanted to sleep, i tried everything to get her to play and be active. She sleeps, well should sleep on her bed in our bedroom and at the moment she is running around barking and we need to sleep. I'm thinking of getting a crate to but her in at bedtime. How do you guys motivate your shiba's when they just want to do nothing? I really need to get her into a routine. Personally my girl gets most of her exercise when we go outside to go potty. But before I was taking her on walks we played a lot of fetch in the house in my hallway. It seems to me that your pups sleeping schedule is off. Whenever you have a free day, wake her up early and take her out with you to the park or something. Keep her active for a day, then she'll be more than ready to sleep by bedtime. I take mine out for one final walk between 30- an hour before bed so she'll definitely be tuckered. I've had a few free days this week, the problem I have is getting her motivated. I'll take her outside with her toys but she'll turn her nose up at them and just want to come inside. We can't go to the park yet as she is only 9.5 weeks old. I did accidentally scare her yesterday with a bin liner that i put into a dustbin, she was pretty shaken up so that may explain why she was quiet yesterday. I'll keep trying to keep her active today and see how we get on. How are you socializing her? I understand a trip to the dog park isn't wise, but are you taking her for walks around the block? Are you letting her meet new people, and introducing her to dogs you know? Longer walks and more play time. And as mentioned, training is a great way to engage her. There are so many places that you can take your puppy that aren't centralized around other dogs or dog parks. I personally hardly ever take Kira to dog parks - I've taken her really only a handful of times. I prefer socialization that aren't focused on other dogs - trips to local farmers markets, hiking on local trails, trips to breweries and wineries, and local parks (not dog parks). Expose your puppy to as many positive experiences as possible at the age she is now!!! As poltergeist said, laser point, though that is really more for my entertainment. In addition to that hikes are great or long walks where we just leave the house and I let him walk to his hearts content not steering home until he voluntarily does. Kong toys are great, he gets his treats but he has to work for it. Laser pointers... Are only for short temporary entertainment. I wouldn't recommend over 10 mins as they might cause issues with your shiba. Also, laser pointers are for lazy people. If you want to entertain your shiba, please be more hands on and interact with your shiba. Training, walks, playing tug, fetch, anything that helps build a stronger bond. To supplement @bootz... the problem with the laser pointer is the dog never wins. Its the reason bomb sniffing dogs actually sniff bombs and "win" during training. Agreed. Laser pointers can cause obsessive compulsive disorders in dogs and cats. The dogs never "win" at the game, and it is seriously lazy if you are using that as a way to exercise or mentally stimulate your dog. Get some toys out, teach a new game, play hide and seek, train them to do new tricks, etc. These are all great ways to entertain a Shiba. Laser pointers are not. I also had to giggle at @BanjoTheBetaDog. That is not exactly how training an explosives detection dog works, but yes... They do get rewarded for hitting on a scent during training. Quake loves playing with this tail teaser toy. We get to practice the "drop it" command and he gets exercise chasing after the toy. Thank you for the suggestions, she has improved since I created the discussion. She is more active during the daytime now, one things that got her going is me brushing her. When I thought she had slept enough I got the brush out, within 10 minutes she woke up and I'd got her playing with her toys. I still can't take her for walks yet as she is too young, (11 weeks tomorrow) therefore I have not socialised her with other dogs yet. I have taken her out to the pet store a few times, in my arms of course, also I have taken her to my grand parents house to get her used to thier 2 cats. There are training classed held a short walk from my house every week so I will take her there as soon as she has had her 2nd injection. She gets very scared when a 'stranger' comes into the house, often going and hiding. I have tried to make it a good experience for her, but it hasn't made a difference yet. She also shakes when I take her out of the house, not sure if this is normal Shiba behaviour but hopefully she will get better when I can walk her regularly. I still can't take her for walks yet as she is too young, (11 weeks tomorrow) therefore I have not socialised her with other dogs yet. Well... You just answered your own question/problem. Even if the dog is not fully vaccinated, you MUST start socialization in and outside of your home immediately. The risks of an under-socialized dog is MUCH greater than the small risk of your puppy contracting a disease if you are careful about the outings. There are threads on this that I urge you to read. You really need to get your dog out and socialized as soon as you can (like TODAY). Just avoid high dog traffic areas and wipe her feet off before you bring her back into your home. Sunyata is completely on point for this. We used a socialization checklist I can't find right now, and the only thing we missed was cats... Boy am I wishing we hadn't missed cats, but we didn't have any near us... my parents have 4, and we are paying for it on our thanksgiving visit now. I did find a socialisation list on another thread, it's enormous but I will try my best to get through them all. Before I picked her up (9 weeks old), she lived with her mother and father plus 3 siblings from a previous litter that were quite grown up. I don't know if that is a good thing but she was fine with them. Where I live there is a park literally just across the road that many people take their dogs. This is one of the places that I plan to take her for walks daily. I can take her now, should I carry her or take her on a leash? I do understand that exposure and socialisation is very important at this stage and I just want her to have the best chance in her life. It is a worry that there are many adults dogs in the area, and of course I don't want her to catch anything. I have read so many discussions on this forum, but I'll go back and concentrate on socialisation topics for a while. Edit: I forgot to add that we will have another puppy in the house in a few weeks, and 8 week old pug cross. Well this afternoon at took her to the park, in my arms. Within 5 minutes she was shaking, I took it easy and strolled round reassuring her. We came across quite a few birds, and a lady with 2 small adult dogs. One of them did bark at us which dig scare Tsuki, but the lady came over to me for a chat and to fuss Tsuki. She did try to get down a few times, but she did settle and became comfortable after a few minutes. I may take her out again tonight either to the park again or for a walk around the neighbourhood. If everyone doesn't mind I would like to bump this. I see a lot of suggestions for hikes. I would very much like to take Suki hiking but she is only 8 weeks old so I do not want to risk doing any long term damage to her growing joints/limbs. Is there a way to have my cake and eat it too on this one? The hiking trail near our home is really steep in the beginning, then levels out for a good stretch before becoming steep again. Would it be possible to still take her but just carry her up the steep part? Puppies can be pretty resilient, let her give it a try on her own and go ahead and carry her if she's struggling. I personally think it sounds like a great way for a growing puppy to expend energy, exercise, bond with you, and provide mental stimulation. Shibas are a sturdy breed, Kira has been hiking with me since she was a puppy and loves it! @Sukis_Mom - Eight weeks is too young to go hiking. For one, she has not had all of her vaccines and is very vulnerable to communicable diseases such as parvo. If the hiking trail is a popular one, I would avoid it completely until she is fully vaccinated. She is also incredibly young and will tire out pretty quickly in addition to the worry about stressing her joints. I would wait until she is at least four months old before pursuing EASY hiking with her. In the meantime, work on things like climbing stairs, descending stairs, easy jumps (on soft surfaces), and increasing her stamina on neighbourhood walks. Thank you everyone! I was originally on planning on waiting until next summer (she would be a year/year and a half then) but I am really happy to hear that there may be a possibility to start in about 4/5 more months (that will put her at 7/8 months of age). I really like the idea of increasing her stamina slowly with walks in our subdivision. Currently we have been taking her on two walks a day though I am not sure if the amount of time we have her out there is too much or too little. She never acts tired when we are out walking and when we come back inside she will play/run around for an extra 15/20 minutes before settling down on the floor. Right now her walks are 15/30 minutes which includes a decent hill. I definitely do not want to over do it nor risk extra exposure to diseases (we do go for her first set of vaccines tomorrow :D ). Should I give in and let her walk until she starts to tire out or keep this schedule until she is older?